Netgalley.com is offering Winter Knitting from MillaMia knitwear for review. It is a lovely book for those of you who wish to knit for children or household items like pillows. The adult patterns include mittens, sweaters and socks. 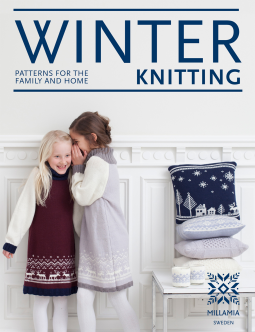 This inspiring new book from the team behind MillaMia knitwear is packed with projects to take you through the wintertime. As the seasons change from cool, crisp autumn to the cold and dark of winter, Scandinavians are particularly good at easing the transition with clothing, interiors and food that bring warmth and light. Sisters Katarina and Helena Rosen aim to share some Swedish wonderful traditions, designs and activities with you – but of course with the signature modern twist that MillaMia bring to all things knitted. In this book you will find a mix of knitting projects to see you through the cold season, including stylish garments and accessories for adults and children, cosy homewares and unique gifts. Indulge in kitting yourself out for the first fall of snow, make clothes that the kids can wear for the festive season and create interior projects that will bring warmth both literally and visually. You will also find a selection of ‘bonus’ projects – with a couple of favourite festive recipes and some wonderful paper projects that any yarn enthusiast will enjoy.